FOR THE MONTH OF JULY, 25% OFF ALL SIZES & MORPHS, WHILE SUPPLIES LAST. Leopard Geckos are native to the Middle East, primarily Afghanistan and Pakistan. These lizards are neither nocturnal nor diurnal, but rather crepuscular, meaning they are most active at dawn and dusk. Because temperatures in this region can reach extreme highs in the daytime, they spend those hours in burrows that shelter them from the heat. (They will also ride out the coldest weeks of winter in these burrows and live off the fat reserves stored in their tails.) The dark of night is also best to avoid as they are a prey item for a number of native predators. If it is unfortunate enough to get snagged by a hungry predator, luckily this crafty gecko has the ability to drop it’s tail in an attempt to fool it’s would be captor. The tail will continue to twitch for up to 30 minutes after falling off, hopefully allowing the gecko to escape! Scales ‘N Tails highly recommends Leopard Geckos as we believe they make great pets for beginners and experts alike. They are colorful, good sized geckos, (growing to about 10 inches,) very hardy in captivity, and typically have a very docile temperament. They are definitely one of the most popular pet reptiles we sell, and possibly even the very first domesticated lizard species. They are commonly bred in captivity, often for particular, highly desirable traits, so there are now many different color and pattern morphs available. 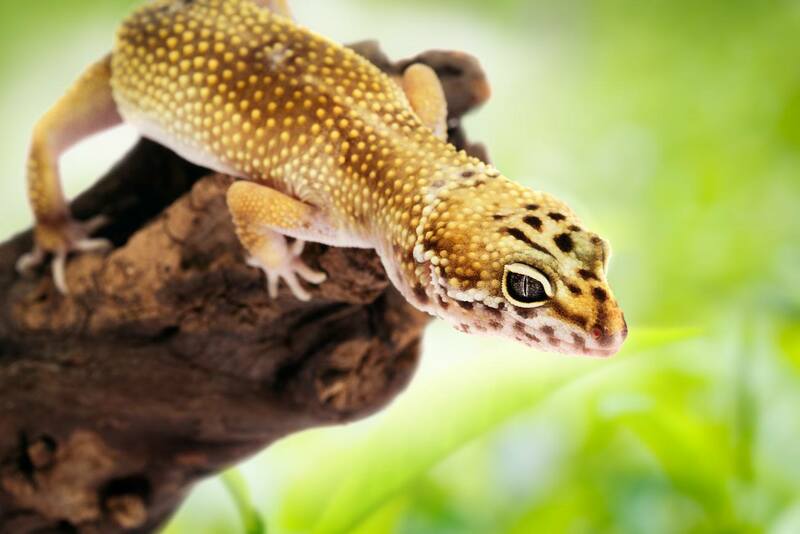 Once it’s environmental needs have been met, simply provide your gecko a few appropriately sized Dubia Roaches or Crickets, (Leopard Geckos do not eat plants or veggies,) every other day and you’ll have a happy, healthy pet. It is actually very entertaining to watch them hunt these insects down. Leopard Geckos are very agile, and have exceptional senses of sight and sound, all of which make for an excellent hunter. They have been noted to almost stalk their prey, similar to an actual Leopard! They are also equipped with 100 individual teeth, which are replaced every 3 to 4 months, keeping them in perfect shape to bite down on the juicy morsels they desire! If you provide the right environment for your Leopard Gecko, then you’ll be able to enjoy your pet for a long time. Compared to some other reptiles, this is a long lived species, with an average lifespan of 6 to 10 years. Some males have been documented living well into their 20s! Finally, we wouldn’t be doing our Animal of the Month justice if we didn’t make it an affordable pet option. For the month of July, while supplies last, we are taking 25% off our entire selection of Leopard Geckos, including all morphs and sizes. If you’re interested in a new pet gecko, there has never been a better time to get one!